Please also visit me at The Children of Ra Temple, dedicated to the teachings of Light and Love from around the world! Last updated: February 23, 2004. January 4, 2003: Well, it's been quite a while since I've updated these pages -- I've been off discovering interesting places (like Moonridge Zoo and Animal Rescue in Big Bear, CA), people (like the folks who run and perform at the Fremont Centre Theatre in South Pasadena, CA) and things (like how to become a freelance writer) -- but now Mama Sekhmet has been nudging me to get back to work. So... I've updated some of the links to other Sekhmet sites, made some of the ancillary pages easier to find, and got the WebRing back up to speed. Sekhmet, also called "Flame," is the fire of enlightenment, the fire that redeems the soul of the dead, liberating it "to become a star of heaven"
The name "Sekhmet" is derived from the Ancient Egyptian word sekhem, meaning "power." Sekhmet is the great Lion Goddess, the fierce twin of Bast. She is usually depicted as a woman in red with the head of a lionness, crowned by an uraeus-encircled solar disk. She is often shown holding both the ankh and the lotus scepter. In the form of the serpent Goddess, Sekhmet took up Her position on the head of Her Father, Ra. In Her form of "the Eye of Ra burning the enemy," Sekhmet is the fire which destroys the serpent Apep. Throughout Egyptian history, Sekhmet was regarded as a power to be invoked to protect the good and annihilate the wicked. However, Sekhmet is also a great healer, and has the ability to transform, rather than destroy, the negative or dark side of any situation. Khem us the dark chaos that gives birth to light without knowing it... Sekhem is its effective power, the destructive power from which conception arises: the male and female factors would make nothing without this pitiless force that wills the destruction of one form for the conception of another and the appearance of a new life.... The personification of sekhem is Sekhmet. Bast, beloved, when thy people call. Passing scatheless where thy fires glow. Til thou camest there and gace them life. 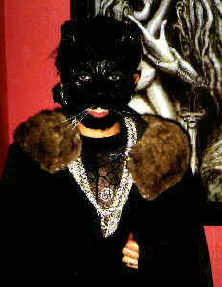 Bast, beloved, Mother of us all. -- Hymn to Sekhmet-Bast from the Egyptian Book of the Dead. Although I was baptized Catholic (but was almost never inside a Catholic church other than that) and visited Christian churches as a teen, my current spiritual path started with Wicca -- NeoPagan Witchcraft -- around 1987. There are many sites about this Nature-based belief system (you can find many using Avatar Search), but my favorite short explanation is expressed in the song Burning Times by Charlie Murphy and Rumours of the Big Wave. The Oasis (see Heru's Oasis for more information). honed my will with Her hands. the one to which i am utterly devoted. The degree of love i feel for Her is indescribable. On March 14, 1999 I was invited to lead the Pasadena branch of the Shinji Sumeikai of America on a guided meditation to the realm of Sekhmet as part of their monthly sampai (transmission of light), the theme for the day being "The Goddess and Spring Equinox". I was joined in the celebration by Shakti -- a priestess of Sekhmet and Ecstatic Dancer, several Sacred Drummers, Rev. James Morton of New York's Interfaith Center (who gave a wonderful speech about why simple "tolerance" of differences is not enough), and over 100 members of the community. Click here to see a copy of the meditation and the temple that inspired it. In October of 1998, Zohara and I made a trip up to Isis Oasis in Northern California for the annual Convocation of the Fellowship of Isis, which turned out to be -- in part -- a gathering of Sekhmet priestesses. The highlights for me were meeting these priestesses and Lady Olivia, the Caduceus meditation led by Nicki Scully, the Sekhmet Mystery Play on Saturday night, and the Sekhmet Empowerment ritual led by Lady Sekhmet on Sunday morning. Click here to see pictures! Also -- we didn't get any decent pictures with her, but we also got to meet our dear online friend and "Mom", Raven Joy! 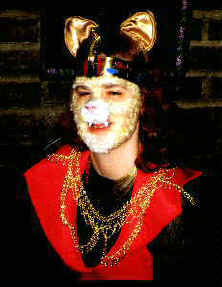 For the 1998 Hallows Party and Costume Contest at Raven's Flight, Zohara and I dressed as CATS-era versions of Sekhmet and Bast. We didn't win anything, but it was fun trying to eat with fangs! Every year around Lammas (August 1), my extended Family and I attend a Pagan Festival called Lammas Fair. This is a 3-day, 2-night camping trip in the local mountains and always includes plenty of wonderful rituals, food, games, workshops, drumming and fellowship. Some years we even remember to take pictures! >can she bring to your life? My personal matron Goddess is Sekhmet. Unfortunately, the story most often told about Her is the time Ra sent Her to destroy "evil" humans and the Gods had to trick Her into drinking beer that looked like blood to stop Her before She destroyed *everyone* (She got a little carried away in Her 'righteous anger' -- one of the things that drew me to Her). After that, She exhibited Her other side - Goddess of Healing. Paradoxically, She was also known as the Goddess who brought pestilence and plague. 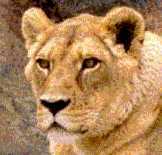 I've also experienced Her 'Mother' side (She was married to the God Ptah, the Master Craftsman, and was the mother of Nefertum, God of Physicians) -- it's a very comforting feeling to be lion cub once in a while -- and Her kundalini side (both Tantric and via the Sacred Prostitute archetype). As a mirror to what I said about Bast, I'd say Sekhmet is more Lust (or Rage), Passion and (Sacred) Sexuality, a Drummer with a load Roar. I also experience a masculine side/version of Her that I call Sekhem. 'Sekhem' means Strength or Power; adding the 't' makes it feminine. I also see Her in the Strength card in the Tarot, both as the woman and the lion. He 'speaks' to me more often that She does -- with Her it's usually pictures or sensations. She has brought a sense of direction and purpose to my life. I may not always know exactly where I'm going, but I know (in the grok sense, not just intellectually) that as long as I'm following Her, I'm on the right path (i.e., working towards enlightenment rather than the mundane). I imagine that this is similar to how most people feel about their own matron/patron God/desses. She's definitely not the only face of the Divine I work with (yes - down deep I believe that They are all The One, or more accurately, The All), but many of the other Gods and Goddesses I feel closest to are either related to Her or similar to Her. As for 'summoning' Her... at this point I feel Her with me most of the time, similar to what Catmom said about Bast, but I do also contact Her during ritual/meditation. There is a mantra from Robert Masters book on Sekhmet that I like to use -- "Sa Sekhem Sahu" (the a's are soft, like 'Ma' or 'Pa' or 'Ra'; the 'hu' is 'who', like an owl -- another one of my Guides; 'sek' is like 'heck'; 'hem' is just like in English, like the 'hem' on your clothes). I use myrrh as a fragrance/incense, but that's just personal preference. I often use 'desert' music -- Peter Gabriel's 'Passion' (Music from the Last Temptation of Christ) is one of my favorites since that time period is when my last incarnation as a priestess of Sekhmet took place). And when I get really into my drumming (Doumbek), I feel Her very close by. It's become one of my favorite magical tools... I use to to raise and send energy as well as to ground and center. I've also been able to "aspect" Her a few times (have Her inside me and in control of what I did and said), but that was never on purpose - it just happened! 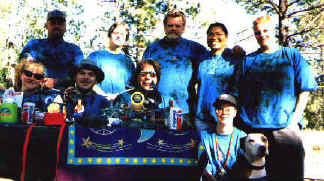 Used for a Healing ritual for New Moon, August 1998. Valley of the Kings Sanctuary and Retreat -- located in southern Wisconsin, home to more than 50 large cats and other animals who had been abused, starved or in danger of death. Tiger Haven -- a sanctuary and rescue facility for big cats located in Roane County, Tennessee. Tiger Touch -- a sanctuary and research center, located on 10 acres of land about 70 miles east of Reno, Nevada. Wildlife Waystation -- a fully licensed, non-profit animal sanctuary located on 160 acres in the Angeles National Forest in California. Thunderhawk -- a Native American operated Big Cat rescue in Florida. Pacific Big Cat & Exotic Animal Rescue -- a nonprofit organization in Washington whose mission is to rescue, care for, and provide education about all exotic animals. Shambala -- perched on the edge of the Mojave Desert, forty miles northeast of Los Angeles, California. Since 1972, this unique eighty acre wildlife habitat has provided a haven for endangered exotic big cats.